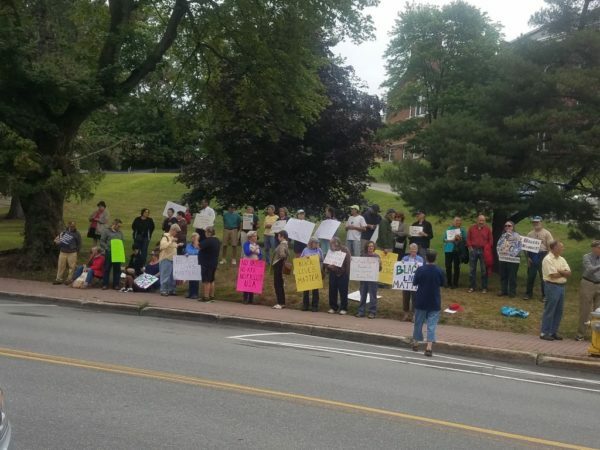 About 50 people from Greater Bangor took part in a two-hour vigil Saturday to show their solidarity with the thousands of counterprotesters who took to the streets of Boston to oppose hate speech. As thousands of counterprotesters descended Saturday on Boston to oppose what they see as hate and racism fomented by white supremacist groups gathering under the guise of support for free speech, Mainers gathered in Bangor to show solidarity. Organized by the Peace and Justice Center of Eastern Maine, Saturday’s Vigil for Inclusion & Racial Justice drew about 50 people to Peirce Park on Harlow Street, where they held signs opposing white supremacy and oppression. “My parents were survivors of the Holocaust. They were Polish Jews who both survived the concentration camps, and we came to the United States,” said Sol Goldman of Bangor, who was among those who turned out. “There have always been Nazi demonstrations. I can’t remember a time without them, but in the past, we’ve always had our political leaders denounce them,” he said. D.W. Mayweather of Bangor, who also took part in the Bangor event, pointed out that the current tensions the nation is experiencing are part of the “continuing saga of America, from the pre-colonial times to the Civil War. When are we going to live by all men are created equal? “What is going on, especially in the past two years, shows that we still have a long way to go,” he said. “I look at the 50 years since the modern civil rights era in the ’50s and ’60s and see [how far] we have come and now this president shows that he wants to roll back everything and he has the support of a group that wants to take it even further than that,” Mayweather said of President Donald Trump’s controversial response to the violence at a white supremacist rally Aug. 12 in Charlottesville, Virginia. “When will the president speak up and use the moral bully pulpit as he should? Does he believe all men are created equal?” said Mayweather, who grew up in the South. “It’s just sad to see. The two-hour vigil in Bangor and a similar event that took place in Rockland on Saturday were scheduled to coincide with the “Free Speech” rally in Boston, which was among nine events across the U.S. in which so-called free speech marches and rallies were held to protest Google’s firing of an employee who wrote a memo against diversity, according to Reuters. The other events were held in Atlanta; Austin, Texas; Los Angeles; Mountain View, California; New York; Pittsburgh; Seattle; and Washington, D.C.
On Sunday, dozens of organizations and churches were expected to gather at Payson Park in Portland for an Oppose White Supremacy: Coming Together For Racial Justice rally.